It's easy to lose yourself in the idea of a person and be blinded to their reality. Dying is easy. Anyone can throw themselves onto the pyre and rest a happy martyr. Enduring the suffering that comes with sacrifice is the real test. A conscience is easier to swallow on an empty belly, simpler to swing with a broken wrist. "I never lied. I just didn't tell you the whole truth." "You said you were alone." "There's hundreds of you. Maybe thousands. You and your 'family' are everywhere." "Just because you're standing in a crowd doesn't mean you belong there." “You walked into this village with a thunder tiger beside you. You have slain demons with your own hands. Are the old myths really that hard to believe? Ladies and gentlemen, prepare to be dazzled. 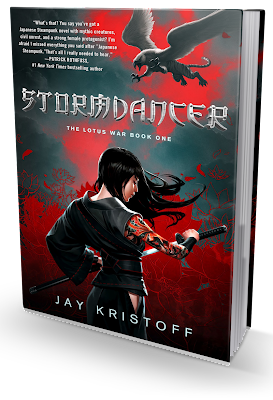 Wild, fantastically imagined and executed with dizzying panache, Stormdancer takes worldbuiling and character development to a level rarely (if ever) seen in YA fiction. This breathless, action-packed story is a seamless fusion of Japanese-inspired fantasy and steampunk. The end product is as stunningly beautiful and delicate as a sakura flower, and as razor sharp as a samurai's sword. Set in Shima, an Imperium on the verge of environmental and political collapse, Stormdancer follows the adventures of one girl who is brave enough to fight for what she believes in - even if it means rebelling against the Shogunate. The world is red, poisoned by the very same thing that brought about a technological revolution that energized the industry - the Blood Lotus. The lotus turned the simple (and backward) nation into an Empire - one of the most powerful nations in the world. It provided people with anesthetics, ropes and canvases, and - most importantly - fuel used in chainkatanas, motor-rickshaws, sky-ships and other cool devices. But it also caused drastic changes in environment - poisoning air, causing temperature to rise and painting skies blood red. People depend on it, some get addicted to it, and most of them fail to recognize it for what it really is - a curse, not a blessing. Yukiko is the daughter of the imperial huntmaster, Kitsune Masaru. Like her father, she belongs to the Fox clan. One day, the Ninth Shogun of the Kazumitsu Dynasty, Yorimoto, has a dream in which he flies through the skies astride a thunder tiger, leading his armies to war overseas. He becomes obsessed with the idea of him becoming a Stormdancer of legends. Charged with the task of capturing the legendary beast is no one else but Masaru and his daughter. The problem is, all the mythical beasts are extinct, no one has seen any in thousands of years, and the mission to find one seems destined to fail. And failure equals death. Stormdancer is a killer. I've never read (or even heard of) anything quite like it. It's an epic and magnificently entertaining tale filled with compelling characters, unforgettable visuals, and powerful messages. At the same time, though, it's not only a thoroughly entertaining story, but also a thoughtful and sensitive examination of honor and loyalty, loneliness and loss, bravery and perseverance. This novel is just as moving, heartbreaking and inspiring, as it is violent, spirited and infused with incredible energy and atmosphere. And its complexity and scope are almost overwhelming. I'll be honest with you and admit that it took me nearly 70 pages to really get into the story. It's not because I found the beginning to be boring, not at all. It's because Jay Kristoff's writing style is so very different (BETTER!) from the usual oversimplified YA prose, I had a hard time getting used to it. I would often go back and re-read certain parts of the story, savouring their beauty. The language was lush and evocative, the characterization - stellar! The passages describing Yukiko and her power (Kenning, i.e. the ability to communicate with animals) were absolutely amazing. Her background story was touching and fascinating in general, but her memories of Buruu (her dog and childhood companion) were especially wonderful. I won't lie, I teared up a couple of times. All the characters are quite extraordinary. They all have believable, unique personalities (often complete with unique skills and abilities), and some of them undergo noticeable revelations. Yukiko is a great heroine. She's fierce, tough, unstoppable, defiant and cheeky. And quite stubborn, but it's no surprise after what she's been through. Her brother died and her mother left her with her addict-father. She was forced to grow up too fast and be the responsible one. She spent her early teenage years taking care of her irresponsible, gambling father. Constantly worried and stressed. She's definitely a very mature girl, she managed to survive in a very harsh reality and I admired her for that. I loved the setting Kristoff chose for his novel. The Japanese-inspired alternative world, filled with Samurais, Shoguns, Ronins and otherworldly creatures straight from myths and legends. The cultural and mythological backdrop was rich and flavorful, vibrant and colorful, and just absolutely mesmerizing. And the many Japanese words and phrases only enhanced the experience, magically transporting you to the Samurai Age of Japan (or rather it's steampunk sibling). It's a truly phenomenal, beautifully written story. I can't wait to read more!